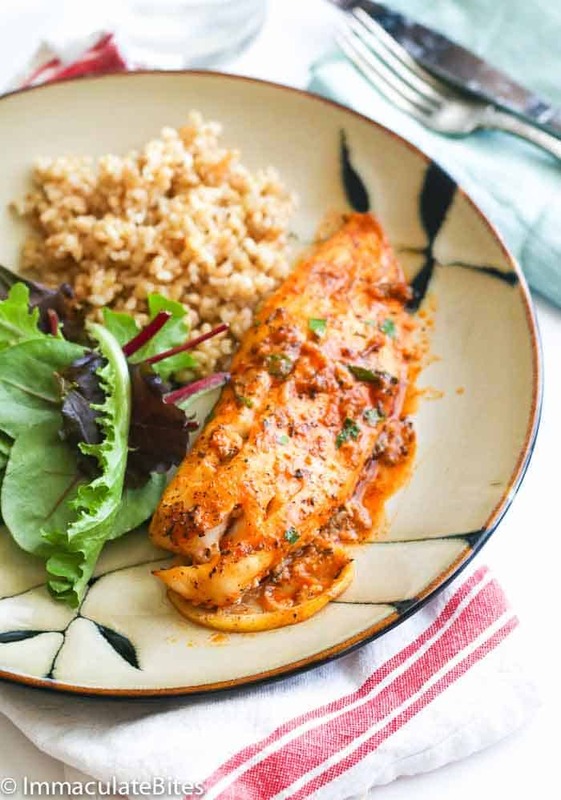 Baked Tilapia – a low-carb and super easy dish that only takes less than 20 minutes from start to finish. Easy yet scrumptious; perfect on weekly rotation! I was called out on Facebook by one of my readers regarding my deep love for anything chicken. Yeah it happens. Okay, in case you didn’t know yet, chicken meat runs in my DNA. My freezer never runs out of chicken . LoL. No matter how I push myself to completely turn my back away from meat, I just can’t. NOPE! So I am taking it in moderation . So I figured out we need a little bit of a chicken break. Can I get an applause? 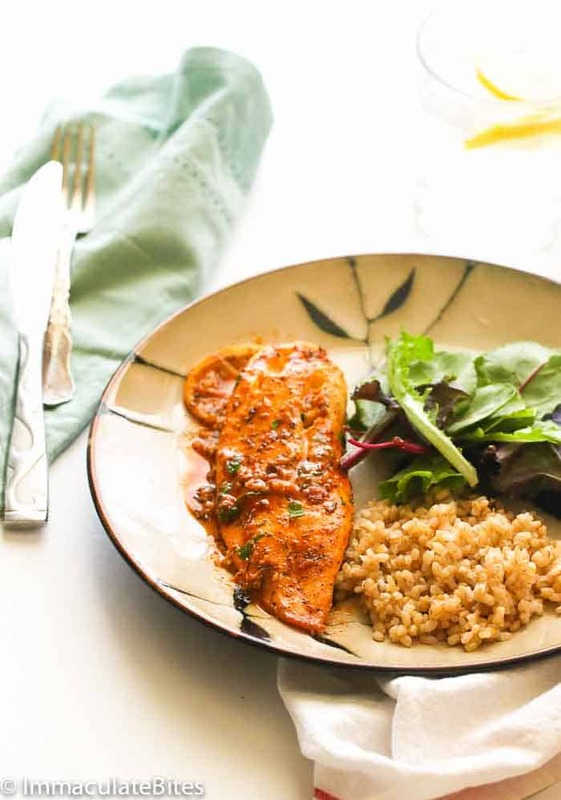 Instead of chicken thigh, we’re replacing the menu now with some healthy and budget-friendly Tilapia loins or tilapia which cooks in 10-15 minutes. Confused between fillet and loins? Well let me explain. Loins are thicker portion of tilapia -their shape, thickness and size is fairly consistent, so much easier to cook with a precise degree of doneness. They are cut from the section behind the head and along the backbone, without the thinner belly and tail meat. 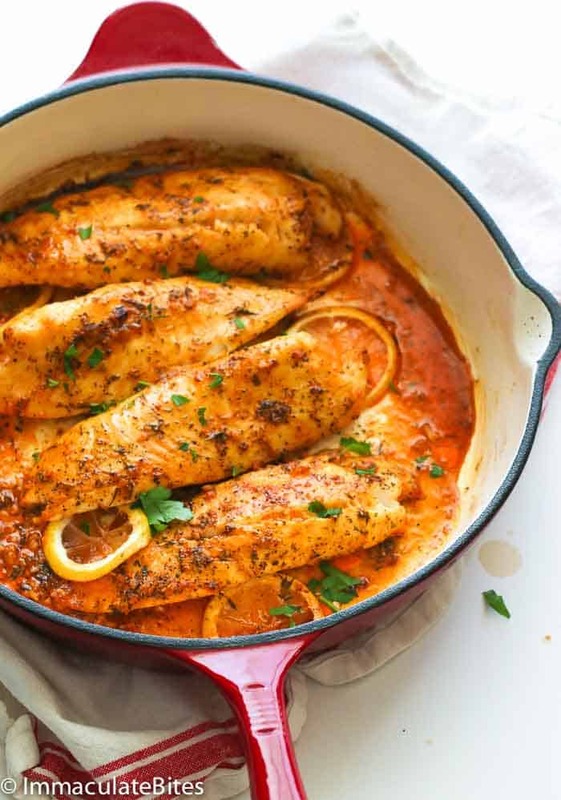 These Baked Tilapia is a healthy low-carb meal seasoned with garlic, paprika and lemon that makes it so delicious in every bite. It’s a perfect choice for those on a diet without sacrificing the taste. It doesn’t even call for complicated steps. 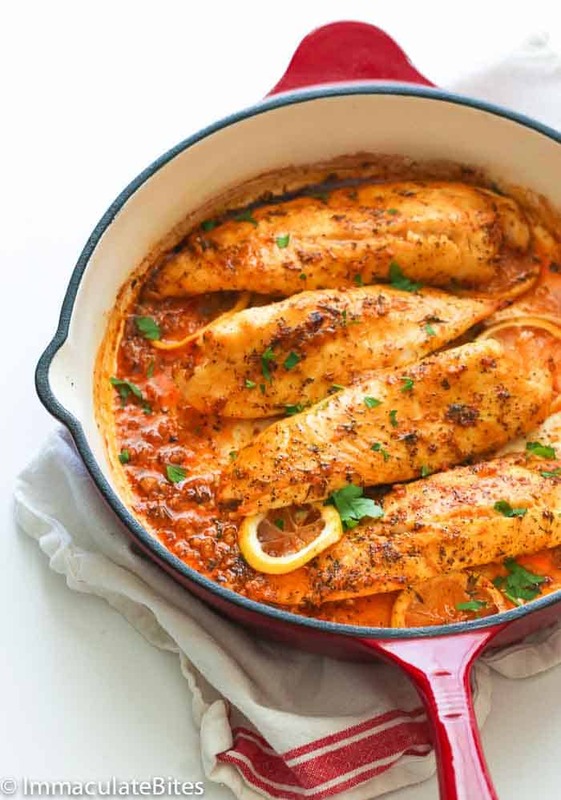 You just have to mix all the seasonings in a skillet, add the seasoned Tilapia and bake. No sweat! It’s super easy, quick, healthy and tasty. Check out note 2 for an even easier way of making it. 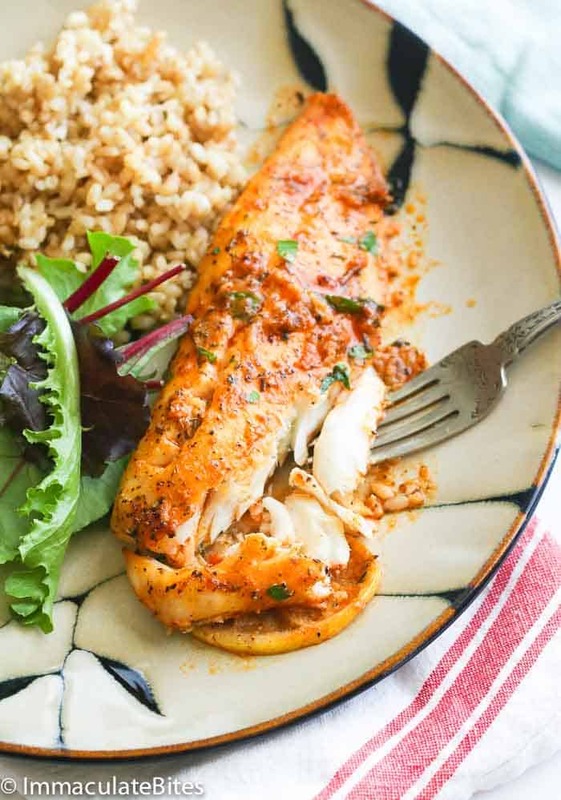 If Tilapia isn’t a hit in the family, you can actually replace it with other white fish including snapper, grouper, flounder, rockfish and salmon. Just remember though that cooking time may vary depending on the size of the fish. To even out your fillet and provide some consistent cooking , fold the thin belly meat beneath the fillet. Place fish in an ungreased 13×9-in. baking dish. 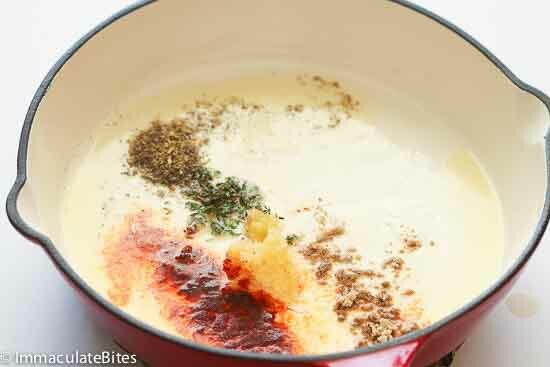 Then combine butter and spices in microwave for about a minute – remove add chicken stock and lemon juice. Season to taste. Then pour over fish and proceed with baking . You may sub tilapia with other white fishes like snapper, grouper, flounder, rockfish and salmon. If you want it dairy-free, you may use olive oil instead of butter. Take note that it’ll affect the taste but it’s still tasty though. Huge tip – know the source of your tilapia. It should be responsibly raised and adhere to the highest international standards. Wild is best! But is hard to come by. So I usually buy from places I trust. If you are not certain ask at the counter. Most places list their fish source. This I got from Costco. 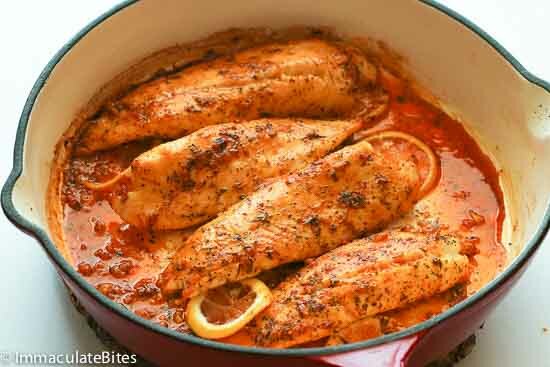 To minimize fishy odor, you may soak the fish fillets in salted ice water or rub the fish lightly with lemon or lime juice. 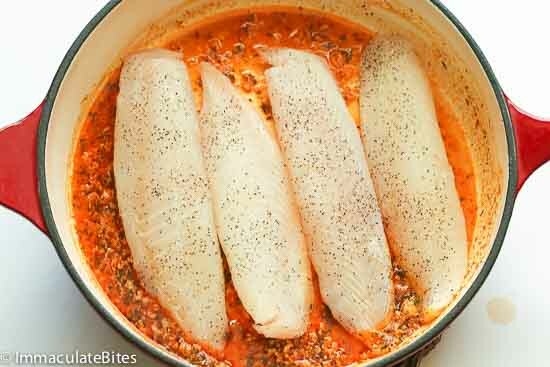 Baked Tilapia - a low-carb and super easy dish that only takes less than 20 minutes from start to finish. Easy yet scrumptious; perfect on weekly rotation! Pour in about 1/2 cup chicken broth , white pepper ,and about 1-2 teaspoons lemon juice, from freshly squeezed lemon. (Start with 1 teaspoon and adjust to taste. 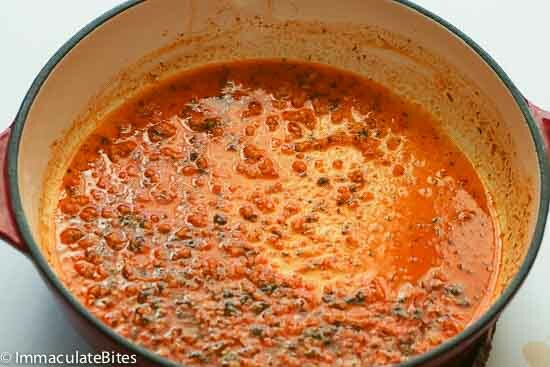 Lightly season sauce with salt if desired). Add fish then brush with butter spice mixture. 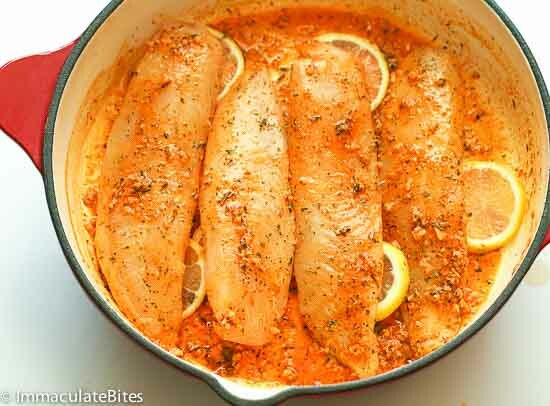 Bake, uncovered, at 400° for 10-15 minutes or until fish flakes easily with a fork. Garnish with fresh chopped parsley. Should the fish to be prepared from frozen, or thawed before cooking? It should be thawed before cooking . Cholesterol and Saturated Fat content look high….what accounts for this? Looks delicious though. I’ll give it a go…. Hi Stephen, it must me the butter – replace with olive oil for less saturated fat. Do let me know how it works out . Thanks! I’m new to your website, everything looks delicious. I love to cook. I’m going to try this recipe this weekend. Welcome Latoria! You are right at home cause I love to cook too! Do let me know how it works out for you. Thanks ! I cooked the tilapia yesterday. OMG!!! It was DELICIOUS!!! My boyfriend LOVED IT!!! He said you can use this sauce on chicken and some other dishes. We had it with Cilantro Lime Rice and steamed Broccoli with onions and peppers. 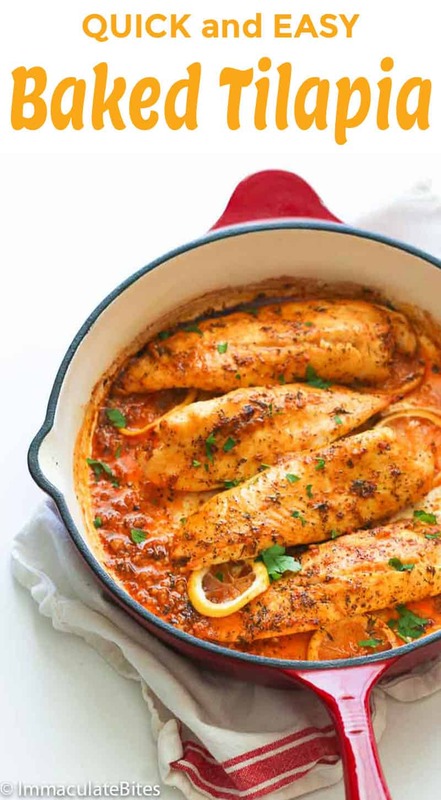 This is now going to be my go-to recipe for fish. I LOVED IT. I also drizzled the juice from the salmon on the rice. 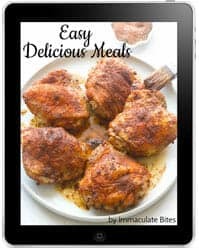 Thanks soo much for a delicious recipe. CORRECTION: That should have been “I drizzled the juice from the tilapia on the rice.” I think I’m thinking ahead to use it on salmon too. LOL!! !